What do you think about Völkl V-Werks Mantra? Went earlier on Völkl Gotama (178cm) but sought a lighter, and longer, all mountain ski. Is speed-stable (+ 70km / h) in piste, easy to navigate and very compliant. Off-piste, even there it is easy to drive but a little too narrow if it gets deeper powder, then. Then you need to work a little more than with a wider ski that flows more. Haven't been touring with it yet but looking forward to the first trip. 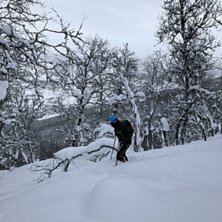 There is no ski for beginners but if you master the whole mountain and are looking for a ski that can make you company everywhere, Völkl Mantra V-Werks is a nice ski companion! Incredibly light and yet completely stable at high speed without being flat. Nice flow in the off-piste, sylvass in the piste and goes like the train uphill. Easy to edge and easy to set up when needed. Best I went. Buying opportunity. Riding style: Fast in the fall line, inside and outside the piste.